Can Pit Bulls ever overcome their stereotype? Don’t like Pit Bulls? Perhaps you don’t know any. When Wil Willis arrived for lunch at the home of his new friends, Jasmine and Cory Grimm, and they opened the front door, he shrank back in fear. Seeing that their guest was nervous, Cory had his dog, Moose, sit down and get used to the visitor. Midway through lunch, Willis was feeding Moose tidbits and petting him. Back at home that evening, Willis, an African American, was still going over what had happened at lunch. He realized he’d reacted to Moose in exactly the same way a police officer had reacted to him a few years earlier. The police officer who stopped Willis might not have thought of himself as being prejudiced. Neither did Willis when he met Moose. But we all make what psychologists call implicit associations, and we make these snap judgments unconsciously in a fraction of a second. 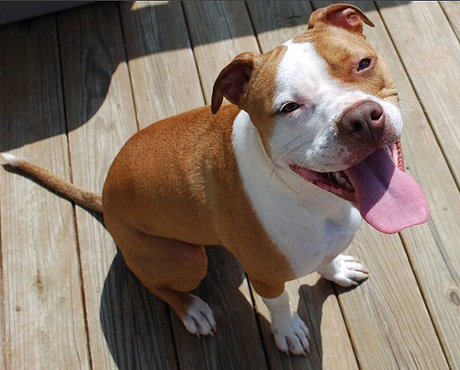 Dr. Lee Jussim, a professor at Rutgers University, has some optimistic news for those who have Pit Bulls and are looking for ways to diminish and ultimately dismantle the prejudice they have to contend with. His studies show that when you get to know a particular person – and Jussim sees no reason why this wouldn’t apply to a dog, too – you tend to base your assessment of them not on any generalized stereotype, but on the real-time information you have about that individual. And that’s good news for people with Pit Bulls who feel they’re up against a tidal wave of discrimination that’s impossible to undo. “There’s plenty of research that suggests that extended, positive contact with a person from a group to whom you harbor implicit prejudice can even reduce implicit prejudice toward that group,” Jussim said. In other words, the more you can give someone a positive experience with a Pit Bull, even just briefly, the more of a dent you’re making in the overall stereotype. Greenwald agrees that stereotypes can change quite dramatically. He cited the example of how American attitudes toward Arabs, and Muslims in general, transformed in the wake of 9/11. As regards Pit Bulls, we already know that the stereotype has undergone several transformations – most recently from “America’s family pet” in the 1940s and 50s to how they’re perceived today. The most impactful way to affect people’s implicit, unconscious attitudes toward any particular group of dogs or other humans is to give them a positive personal experience. That doesn’t mean that a single positive experience with one dog is going to undo years of fear about an entire population. But it all works toward correcting misperceptions and overcoming discrimination.